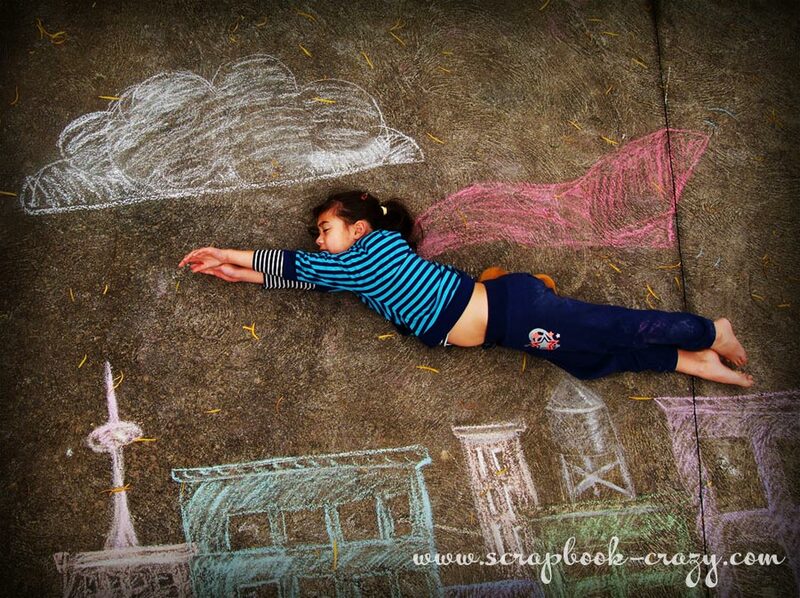 Its a bird, its a plane, no it's super girl! Just thought I'd share a bit of photo lovin from a bit of fun that my dd and I had recently. We were a bit tired of the 'say cheese' pics that we somehow always manage to end up with so we took a bit of inspiration from Coldplay's 'Strawberry Swing' and created our own version of a superhero scene. So we headed out the back of the house with a brand new box of Crayola sidewalk chalk in all the pretty colors of the rainbow and drew a city scenescape complete with a water tower, clouds and buildings. I drew a fair bit more than is included on the final photos, best to err on the side of caution. Placing DD was kinda tricky, we tried several different super hero poses and this pic came out the best. The concrete is kinda hard (ya think?) so she wasn't happy to lay around all day while I tried to shoot the perfect pic. All in all it was well worth the effort and will do it again soon.... i think. I'm reading: Sidewalk Chalk Photograph experimentTweet this! Such a cool idea with the chalk. I love it! I can't wait to see the mini book if you make it. Thanks Becky T. I checked out that blog post. Great pictures! By the way how can I find more information to advertise on your site? Thanks so much for sharing this! I would love to start making my own scrapbooking albums... I just need more patience! Luv it! What a cool and fun idea! Great job with the chalk drawings. Thanks for sharing!